A gun concealed inside or in the shape of a briefcase. Most of the examples under IKEA Weaponry pack away into a briefcase when disassembled, other than those deliberately disguised as something even more innocuous. Turns out to be a case of Truth in Television. The CIA, as well as American government and military bodyguards, do actually use submachine guns concealed in cases (just like the one depicted). The case is built with a trigger on the handle that allows it to be fired without removing the weapon. See also Senseless Violins, when weapons are concealed in an instrument case, and Handbag of Hurt, when the briefcase itself is used as a melee weapon. Black Lagoon: Roberta uses a machinegun briefcase in her initial appearance. Used by a pair of bodyguards in the opening scene of Ghost in the Shell. The briefcases also make an appearance in the manga and at the end of Ghost in the Shell: Stand Alone Complex being carried by the American Empire agents who are accompanying Gouda in the final episode of season 2. Black Cat has the Sweeper Sven Vollfield, who carries a machine gun (amongst other assorted items like a net launcher) inside his briefcase which he carries at all times. Kazuki in Ga-Rei -Zero- dual wields anti-demon machinegun briefcases. Also, this trope is somewhat similar to Senseless Violins, except that the carrying case is the weapon. This is the preliminary weapon of The Invaders in Gate Keepers, to go with their identical suit-and-tie motif. Manako from Daily Life with Monster Girl has a briefcase that unfolds into a sniper rifle. The bonus chapter at the end explains that it's Awesome, but Impractical. A variant is used in Tokyo Ghoul. Early on, Kaneki is warned to report to the manager if someone carrying a briefcase every enters the cafe. That's because Ghoul Investigators carry their weapons in innocent-looking silver briefcases, which could hold anything from a BFS or a BFG to a spiked whip or a Sinister Scythe. These weapons are deployed automatically into the user's hand with a click of a button concealed on the handle. One-Punch Man: Genos has a briefcase that transforms into a pair of arms for him to use to fire powerful blasts of energy. The Trope Codifier may be Bond's briefcase in From Russia with Love, which is the first real Bond gadget. Amongst its other tricks, it features a rifle folded up inside and a tear gas booby trap. The Living Daylights showcases a rocket launcher concealed within a stereo. Q says that it was designed for the CIA and agents assigned to North America, and says it's called "The Ghetto Blaster". In Judge Dredd, a prison warden hands Rico a small case containing Rico's old badge. Rico quickly reveals that the case itself is a reconfigurable handgun in disguise. Why the warden handed his most dangerous prisoner a package without inspecting what was inside it is a Wallbanger that is never explained. In Iron Man 2, Tony has a briefcase that converts into an entire suit of armor. This is straight out of the comics too (although there, the armor is usually stored inside the briefcase). To really get into this trope, one action figure of this armor — the Mark V — has a briefcase that becomes a missile launcher. 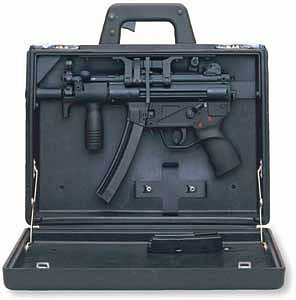 In The Replacement Killers, the back-up hitmen used the MP5 briefcase described below. In the Jet Li film Romeo Must Die, the bodyguard of the Corrupt Corporate Executive keeps an assault rifle in a briefcase. The handle of the briefcase is actually the rifle's rear sights and a hidden button causes the briefcase to open and fall away. Faster: The unnamed Professional Killer is shown packing a suitcase with strapped-in guns and knives. Highlighted in Lord of War, when Yuri quips how easy disguising weapons in camcorder cases was in the 1980s due to the size of camcorders. How Sal smuggled his S&W M76 into the bank in Dog Day Afternoon. Similarly, Sonny smuggles his M1 Carbine in a large wrapped present. The Scorpio killer in Dirty Harry carried his disassembled sporterised Arisaka rifle and an MP 40, plus several magazines, in a suitcase. The protagonist of The American is given the job of building such a weapon for a female Professional Killer, who wants a silenced automatic rifle that can fit in a small space. He modifies a Ruger Mini-14 and even prepares the briefcase that carries it in stripped-down form. The latter two installments of Robert Rodriguez's Mariachi Trilogy feature Mariachis wielding a wide variety of weapons disguised as guitar cases, including machine guns, rocket launchers, flame throwers, and a bomb. Prime Cut: Irish gangster Lee Marvin conceals a sub-machine gun in his leather briefcase. The Soldier: During the mission briefing, the Soldier opens a suitcase with everything they need enclosed neatly in foam sections, from a Tranquilizer Dart-firing automatic weapon to folders containing the nuclear launch codes. Eggsy's weapon to assault Poppy's Compound in Kingsman: The Golden Circle which consists of a Machine Gun, Rocket Launcher and a Riot Shield. In Snow Crash, Reason is mounted inside a suitcase, though it does have a heat exchanger coming out of the side. The Executioner: while posing as a drug dealer's bodyguards, Able Team are each equipped with a briefcase with an Uzi inside and a steel trauma plate for protection. "If you see a bullet coming, just block it." A duffel-bag variation shows up in American Assassin. Adele's servant Tovera routinely carries one in the RCN series. Get Smart: Maxwell Smart had one of these once, as did his inspiration, James Bond. Though its first seen being used by a KAOS-affiliated hit man played by Leonard Nimoy. Kamen Rider Decade had a card case which could extend a handle and barrel to be used as a gun. It could also extend a blade to be used as a sword. Deadliest Warrior: One of the weapons used by the CIA in CIA vs. KGB is a Walther PPK hidden in a briefcase with a pulley system (terminating in a string looped around the finger) attached to the trigger. The agent assigned to test it manages to shoot all three targets perfectly while carrying the case normally. Dennou Keisatsu Cybercop: Each weapon used by the Cybercops (with the exception of their standard personal firearms) come in a standard suitcase. On Boardwalk Empire, Al Capone walks into Dean O'Banion's flower shop, and is seconds away from killing him when Van Alden walks in, carrying a briefcase full of electrical clothing irons. Van Alden works as a door-to-door salesman and these are just his samples. He does not know O'Banion and is simply in the wrong place at the wrong time. O'Banion quickly gets Capone to back down by convincing him that Van Alden is his bodyguard and has a gun in his briefcase that he's perfectly willing to use if Capone doesn't back down. In one episode of Arrow, an assassin takes out his targets by posing as a lawyer and shooting them through his open briefcase. Hot Chicks RPG. The Trick Case can fire a weapon while it's inside the briefcase. The Discarding Case has a hidden switch that causes the case to fall away, leaving the weapon in the user's hand. Rifts introduced a briefcase assault rifle and shotgun in Triax 2. Top Secret, Polyhedron #32 adventure "Operation Butter-Up". One of the bodyguards of an Arab sheik has a briefcase with an Uzi submachinegun stored inside of it. The Uzi can be triggered to fire while it's still inside the briefcase. One of the pre-generated Player Characters has an attache case with an Uzi inside it. The Uzi can be fired while it's still inside the case. Perfect Dark had the laptop gun, which could also double as a turret. NightFire has the Phoenix Ronin, a minigun concealed inside of a briefcase that can be set down as an automated sentry gun or operated by remote. Zombie Revenge featured the two guitar-case weapons from Desperado. The Pandora gun in Devil May Cry 4 is carried around like a briefcase. It can turn into a crossbow, a bazooka, a laser cannon, a minigun-version of the more realistic version of this shown above, a blade boomerang and a mobile missile launching fortress, and when opened, it produces a brilliant flash of light that instantly destroys all enemy shields in addition to damaging them. It also has 659 other forms as well, but naturally, you'll never actually see any of them in gameplay. See more here . The 'Sniper Case' from the Hitman games allow you to carry a disassembled Sniper Rifle around in a briefcase without suspicion, as sniper rifles are too large to be concealed in 47's jacket. There are also a few other suitcases for other types of rifles, which come fully-assembled. Also a subversion as these suitcases are so long that somebody should be asking questions. Secret Agent Clank goes one step further and gives us the Blowtorch Briefcase. No One Lives Forever has the rocket-launcher briefcase. Natasha, one of the characters the player can choose in Rusty Hearts, can use the 'Weapon Bag' which takes this trope to its logical conclusion as it can change into a minigun, RPG, and even a small personal bunker lined with cannons depending on what skills the player chooses to pick up. Modern Warfare 3 adds the Magpul FMG-9 (see Real Life below) as a secondary weapon. It works much the same as the Glock 18 does, though with the player character unfolding it for the initial-pickup animation. 007: From Russia with Love replaces this with the Briefcase Turret (see the "Phoenix Ronin" entry below). It's Q's briefcase, but with an automated turret and photoelectric sensor (like the kind you see on those tapless sinks in McDonald's). The kicker: once deployed, it cannot be retrieved. Played for Laughs by Glennz in Professional , with a Briefcase NES Zapper. RWBY: Coco of Team CFVY has her handbag, which transforms into a rotary cannon when the need arises. In the SWAT Kats episode "The Dark Side of the SWAT Kats", the evil Mirror Universe version of Deputy Mayor Briggs had a gas gun in her briefcase. She used it knock out two guards so she could release what she thought were the her universe's evil Swat Kats. Samurai Jack: in "Jack and the Labyrinth", the stranger carries a multipurpose briefcase that has a machine gun inside as well as a lighter. Young Justice: Red Arrow uses a compound bow version of this to stop an assasination attempt. Truth in Television: Heckler and Koch makes a special briefcase for their MP5K, as seen in the page image. Here's a video. Magpul made a concept product (the FMG-9) that looked similar to a small briefcase that housed a Glock and a flashlight and could easily fit into your back pocket. All you had to do was flip it open and you'll be ready to go. Magpul also makes a near-identical kit for airsoft guns, but the real one never reached the production stage. The CETME Ameli is a light machine gun, 5.56mm caliber, capable of fitting inside a briefcase. Unlike the above examples, it does have to be removed and assembled before use, but that is surprisingly quick. During the assassination attempt on former President Ronald Reagan, Agent Robert Wanko pulled an Uzi out of his briefcase in order to cover the President's evacuation to the hospital moments after the President had been shot. The Ares FMG appears to have this idea in mind. The Nerf Deploy CS-6 is a pump-action blaster that can collapse into a compact "briefcase" form. Beyond 2000 featured a concept of a very rapidly firing submachine gun with a Laser Sight, the AM-180A, based on the American 180 submachine gun (distinctive for its saucer shaped pan magazine mounted on top of the weapon and the secret to its very high rate of fire), which not only made for deadly accurate shots, but also fired so rapidly it could shred most materials to bits and even penetrate bulletproof vests. A concealed version was developed in parallel, being built in to a briefcase that even included the Laser Sight, and like the pictured weapon above, could be fired with the case closed (in fact during the show, the briefcase version was used to demonstrate that a bulletproof vest was futile in protecting the victim from this weapon). The standard/non-concealed version of the AM-180A also happens to be IKEA Weaponry, and was designed to be easily assembled in complete darkness. While SMGs and the like really do utilize this trope, one way fiction often misrepresents it is with long-range sniper rifles that disassemble to fit in a briefcase. Such weapons are very precisely fine-tuned and the disassembly and reassembly process would throw even an experienced sniper off - it doesn't take much to miss when firing at a target thousands of feet away. The very few true rifles that can be disassembled in this fashion are generally used with iron sights only at ranges of 500 yards or less, usualy for hunting small game in an emergency. DRD Tactical's Paratus-16 rifle series is a family of assault rifles designed to be stored in 3 segments inside specialy designed briefcases that can be assembled in less than a minute. A semi-auto civilian version is readily available, but with a $5,000 price tag (as opposed to $800 to $1,500 for an FAL, $2,000 for an AR-10, or $3,000 for a SCAR-17S) and no real advatages over other .308 rifles outside of it's takedown feature, it hasn't exactly caught on.